Ever been stuck behind a caravan? This clever vid from Ford of Europe will either make you laugh or trigger a dark, primal urge to kick something very hard. 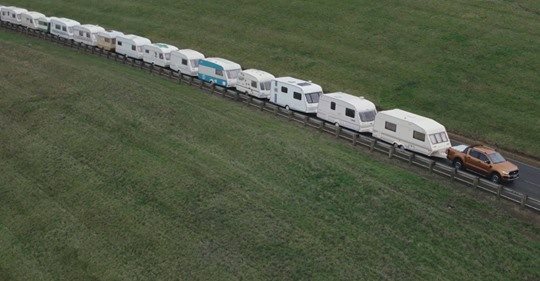 Looking for a way to promote the Ford Ranger’s new-to-the-UK 2.0-litre twin-turbo four-cylinder diesel powertrain, Ford of Europe grabbed 15 caravans (as you do) and jury-rigged them in one single, continuous line of traffic-restricting hell. The resulting video would no doubt upset SOMEONE if Ford Australia tried to screen in here, but hey! YouTube! The stunt is designed to showcase the ability of the twin-turbo 2.0-litre/ten-speed auto’s driveline over the 3.2-litre five-cylinder diesel engine which, while still in use in markets around the world, is in line to be phased out in the next couple of years. Locally, it's offered in the Ford Ranger Raptor as standard, and in the Ranger XLT and Wildtrak and Everest Trend (option) and Everest Titanium (standard). The smaller capacity engine makes 156kW and 500Nm, which is 10kW and 30Nm stronger than the five-potter. As well, the UK is adopting two single-turbo versions of the 2.0-litre diesel to replace the ageing 2.2-litre four-cylinder oiler that's still used here in 4x2 versions of the Australian Ranger. Based on the same block as the twin-turbo, a 95W/340Nm entry-level 2.0-litre will be complemented by a 125kW/420Nm version. Will we see more 2.0-litre Rangers in Australia? We say yes.